West New York is a vibrant community, and we’re proud that you’ve helped make our residential cleaning services #1 in customer satisfaction in Yelp! At Maid in Hoboken, we know our neighbors in West New York have things they’d rather do than sweep, mop, dust, or perform the 1001 other housecleaning services our professional cleaning teams are dedicated to providing. That’s why residents from the Hudson River Waterfront Walkway and Boulevard East to North Bergen, and from Guttenberg to Union City and Weehawken, turn to us for the best home cleaning service available, from move-in to move-out cleaning! Our superior cleaning service starts with our superior staff. We carefully screen and perform extensive background checks on all our team members, ensuring they are dependable, honest, and committed to providing the best customer service possible. Maid in Hoboken gives you the flexibility to create the house cleaning service plan that fits each customer’s needs and budget perfectly, including weekly, bi-weekly, monthly or special occasion cleaning services. Our crews receive the finest training and are equipped with professional quality cleaning tools, and we back that up with a 100% satisfaction guarantee. If you’re not totally pleased, contact us within 24 hours after the appointment, and we’ll redo the job to your satisfaction at no charge. Find out why your neighbors on Riverwalk Place, at the Landings, Rivertrace and throughout West New York have Maid in Hoboken handle all their cleaning needs. In addition to providing eco-friendly housecleaning solutions in New Jersey, we also offer commercial cleaning services. 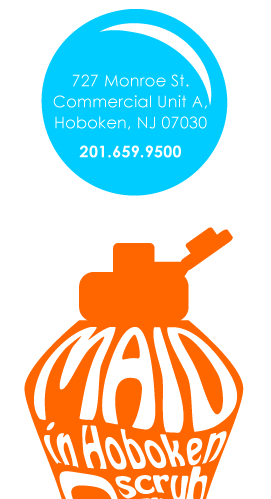 Contact us today, and let Maid in Hoboken help you clean up your act, like we have for so many West New York residents!